Playing a game of tag for a month for 30 years can't be true, right? But the movie Tag is based on a true story, except with added wacky dialogues, crude humour, and no-holds-barred action to see who's the last man standing. It hit cinemas just last week and if you're up for a silly adventure film with a great cast that delivers laugh after laugh, you should go watch it now. WARNING: the insane and absurdly over-the-top events that happen to the movie's characters are too silly to keep a straight face. Watching it got us thinking of other bro-bonding movies that have an unconventional collection of characters that flat out entertained us more than we thought it would. If you've watched Tag and want to watch more films like it, we've compiled a list for when you crack open a cold one with the boys. The classic and probably the most iconic of the bro-bonding movies, The Hangover is a Las Vegas post-bachelor party movie that finds three hungover groomsmen in a race against time to find the missing groom and get him back to Los Angeles in time for his wedding. Straight up funny and never lets down with the hysterical dialogue, The Hangover is the definition of the word hilarious. It features a break out performance by Zach Galifianakis, and this won't be the last time you see him on this list. A solid cast of characters and a fun-filled adventure of manhood drives this comedy flick. Danny and Wheeler trash their minotaur company truck onto a school's horse statue (sounds hilarious already) and are given the choice between jail and community service. They choose the latter and instantly regret it as they have to bond with two boys that are as, if not more, ridiculous than them. It's basically Two and a Half Men but in a camp-like setting and an extra half man. So, three men. Doesn't sound as catchy. Do you know people who just randomly attend a friend or relative's wedding and you ask yourself, who the hell are these guys? Well, they're porbably not Owen Wilson and Vince Vaughn, but they might be just like them. The witty dialogue and awkward situations carry this movi. Rachel McAdams is at her sexiest as the main love interet and Isla Fisher convincingly plays her stalker, weird-af (but equally) hot sister. This is the most star studded cast in a bro movie ever. From James Franco and his buds, to Emma Watson playing a tough woman bullying her way to survive, this film has everything and everyone. The cast play as their fictional (yeah right) selves. A celebrity party goes wrong because of an apocalypse of biblical proportions, and Franco and his friends are trapped inside his house while the world they knew disintegrates outside. Pro-tip: bring your own Milky Way chocolate bar. You'll thank us later. What did we tell you? Zach Galifianakis returns with him setting things downhill for Robert Downey Jr.'s Peter Highman, who will be a dad for the first time when his wife gives birth in about five days. Packed with car-chases, explosions, and ridiculous behavior, what's not to lvoe about this movie? RDJ and Galifinakais' chemistry as people on opposite sides of a coin set up a lot of banter-filled laughs (and tears) throughout. Ever been the outcast that just wants to score booze and babes to be part of the in-crowd? Yes? Then you'll relate to this movie easily. Jonah Hill and Michael Cera play best friends who have high hopes for a graduation party, but Bill Hader and Seth Rogen as police officers complicate everything for them and their mission. Plus, their bromance is extremely cute and hysterical. This movie follows three friends who are celebrating their last Christmas together before they go their separate ways and live their own lives. 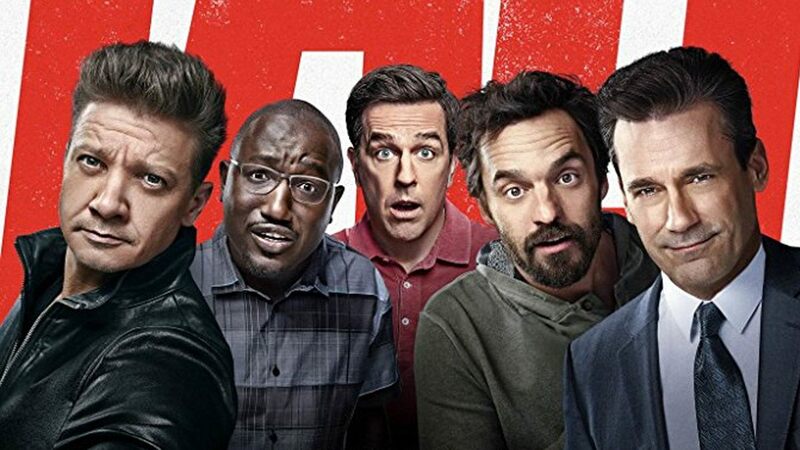 Joseph Gordon-Levitt, Seth Rogen, and Anthony Mackie isn't the kind of trio you thought would team up for a movie like this, but their chemistry is undeniable, producing laugh after laugh and make the movie funnier with each passing moment. Seth Rogen seeing the crucifix of Jesus in church is probably the best scene in the film.